Properties in Soucia average 4.6 out of 5 stars. Property 12: Detached chalet - 5 people - 800m from the hedgehog waterfalls - Free Wi-Fi - Chalet N°4 "Le Lynx"
Property 13: Detached chalet - 5 people - 800m from the hedgehog waterfalls - Free Wi-Fi - Chalet N°1 "L'éventail"
Detached chalet - 5 people - 800m from the hedgehog waterfalls - Free Wi-Fi - Chalet N°10 "Le Moulin"
Property 14: Detached chalet - 5 people - 800m from the hedgehog waterfalls - Free Wi-Fi - Chalet N°10 "Le Moulin"
Chalet Hérisson *** 8 people comfortable with beautiful panorama. Property 15: Chalet Hérisson *** 8 people comfortable with beautiful panorama. Detached chalet - 5 people - 800m from the hedgehog waterfalls - Free Wi-Fi - Chalet N°5 "Le Gour bleu"
Property 21: Detached chalet - 5 people - 800m from the hedgehog waterfalls - Free Wi-Fi - Chalet N°5 "Le Gour bleu"
Detached chalet - 5 people - 800m from the hedgehog waterfalls - Free Wi-Fi - Chalet N°8 "La Forge"
Property 24: Detached chalet - 5 people - 800m from the hedgehog waterfalls - Free Wi-Fi - Chalet N°8 "La Forge"
Cozy chalet in the beautiful Jura mountains. Our family loved our stay at this beautiful chalet tucked in the mountains, overlooking a charming Pinocchio village. Madame Barbe greeted us with a gift of wine and let us in, but spoke absolutely no English and our French is apparently so poor that we were reduced to pantomime. This visibly frustrated madame, but we made it through. The chalet was lovely and comfortable with antiques throughout. There were 5 bedrooms, 3 baths, and plenty of room for our family of five. The kitchen was very small by American standards, but quite comparable to the other French kitchens we saw, and was full of all the dishes, pots, etc. we required. We did not know that there would not be linens or towels, so we had to buy them in the village. The washer and especially the dryer were very convenient. The view from the balcony was breathtaking - especially the sunsets. We grilled on the bbq several evenings. It was very quiet both day and night. In fact, it was so quiet we could hear the cow bells on the cows grazing on the hills above us. The Jura has a wealth of experiences to offer travelers. We swam in the lakes, explored caves, hiked through forests, played in waterfalls, visited churches, and enjoyed the local wines and fondue. 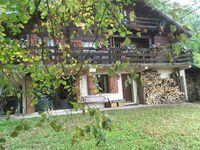 We highly recommend visiting the Jura mountains and would stay in this adorable chalet again - especially if we improve our French and bring towels.